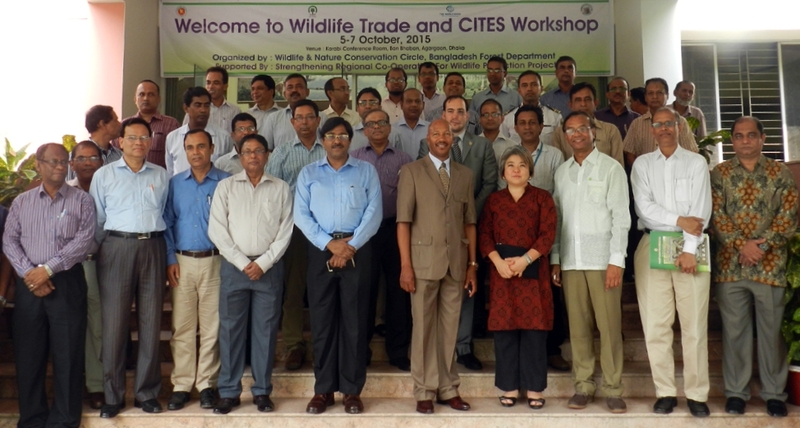 The Secretariat of the Convention on International Trade in Endangered Species of Wild Fauna and Flora (CITES) and its partners in the International Consortium on Combating Wildlife Crime (ICCWC) supported a one day workshop on CITES and a two-day cutting-edge training on wildlife law enforcement in Bangladesh on 5-7 October 2015. The training was tailored based on findings resulting from the implementation of the ICCWC Wildlife and Forest Crime Analytic Toolkit in the country, which produced a number of specific recommendations for Bangladesh to implement to enhance its national capacity to respond to wildlife and forest crime. The training was provided upon request from the Bangladesh Forest Department in response to these recommendations. The workshop provided an opportunity to reflect upon the ICCWC toolkit implementation findings and highlighted the need for increased cooperation to combat wildlife crime. The ICCWC training strengthened the capacity of authorities to effectively implement and enforce CITES and focused on strengthening the skills of law enforcement officers from across the country to tackle wildlife and forest crime through the use of a broad range of innovative and specialized investigation techniques. It also exposed these officers to a number of tools and services available through ICCWC partner agencies and highlighted the importance of targeted law enforcement responses. Mr. John E. Scanlon, Secretary-General of CITES, noted that “this workshop highlights the value of conducting a national assessment using the ICCWC Toolkit, which provides a framework around which a comprehensive strategy can be developed in a coordinated and targeted manner”. Mr. Scanlon further stressed that “the training has been tailor-made to address the specific needs identified by a thorough analytical process. Ensuring that these needs are addressed to further strengthen national law enforcement responses to effectively fight illegal trade in wildlife is crucial”. Mr. Md. Yunus Ali, Chief Conservator of Forests, Bangladesh Forest Department emphasized that "continued regional collaboration and inter-departmental coordination and collaboration of the law enforcement agencies of Bangladesh is essential to combat wildlife crime." Dr. Tapan Kumar Dey, Conservator of Forests, Bangladesh Forest Department mentioned that “to combat wildlife crime more effectively, the Forest Department needs more manpower and training. The additional knowledge will empower wildlife law enforcement officers in the country." The workshop on CITES brought together representatives from Bangladesh Forest Department and different law enforcement agencies of the country, including the Rapid Action Battalion, Coast Guard, Police, Bangladesh Boarder Guard, Customs, Dhaka District Administration, Ministry of Law, Justice and Parliamentary Affairs and Ministry of Environment and Forests. It was followed by an ICCWC training on wildlife law enforcement, during which experts from the CITES Secretariat, INTERPOL and the WCO, as well as from the Bangladesh Forest Department, provided training to 32 officers from Forest Department. The event was organized by the Bangladesh Forest Department, in close cooperation with the CITES Secretariat and ICCWC partner organizations. The Bangladesh Forest department mobilized funds available through the Strengthening Regional Cooperation for Wildlife Protection Project, a comprehensive project funded by the World Bank to increase the capacity of its law enforcement community to combat wildlife crime.